HOUSTON, TX- The Republican Liberty Caucus proudly endorses Read King for State Representative in HD 64. 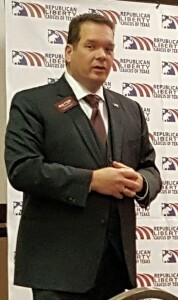 Read has been an activist for liberty issues for years and is well respected throughout the state by liberty principled Republicans. His presence will only serve to strengthen the Texas House. The RLC state board voted unanimously and enthusiastically to endorse King, and we look forward to seeing him continue the great tradition of RLC endorsees in the House like Jonathan Stickland and David Simpson. Endorsement is based on answers to our candidate survey and answers are kept strictly confidential, but our endorsement conveys our confidence that a candidate has a strong belief in individual liberty and limited, constitutional government. We urge all voters in House District 64 to support Read King.